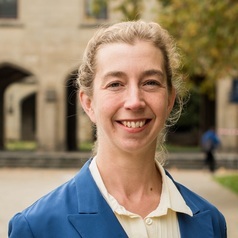 Vanessa Teague is a Senior Lecturer in the Department of Computing and Information Systems at at The University of Melbourne. She did her Bachelor's Degree at The University of Melbourne and her Ph.D. in cryptography and game theory at Stanford University. Her main research interest is in electronic voting, with a focus on cryptographic schemes for end-to-end verifiable elections and a special interest in complex voting schemes such as STV. She was a major contributor to the Victorian Electoral Commission's end-to-end verifiable electronic voting project, the first of its kind to run at a state level anywhere in the world, joint work with Chris Culnane, Peter Ryan and Steve Schneider. She recently discovered, with Alex Halderman, serious security vulnerabilities in the NSW iVote Internet voting system. She has been invited to appear before several parliamentary inquiries into elections at the state and federal level, to answer questions on electronic voting.